Can Plant Hormone Therapy Relieve Citrus Greening Grief? The fruit on this tree is showing the effects of citrus greening. Scientists are now looking into plant hormone therapy as another possible management solution. 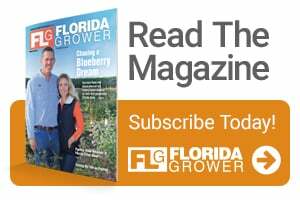 For more than a decade, citrus greening has puzzled and plagued Florida growers and researchers alike, forcing stakeholders to think and reach outside the box for solutions — any. Now, University of Florida scientists believe a group of plant hormones might eventually be a helpful tool for those dealing with the disease. Fernando Alferez, a UF/IFAS Assistant Professor of horticultural sciences, is leading a team of researchers studying the effects of Homobrassinolides (HBr), a specific type of plant hormone, on greening-infected citrus trees. Early results show with the hormone, fruit is maturing faster and is 20% heavier, according to Alferez. The hormone also helps reduce the number of oranges that drop from the trees, he said. In treated trees, scientists have seen 15% to 20% more fruit per tree. 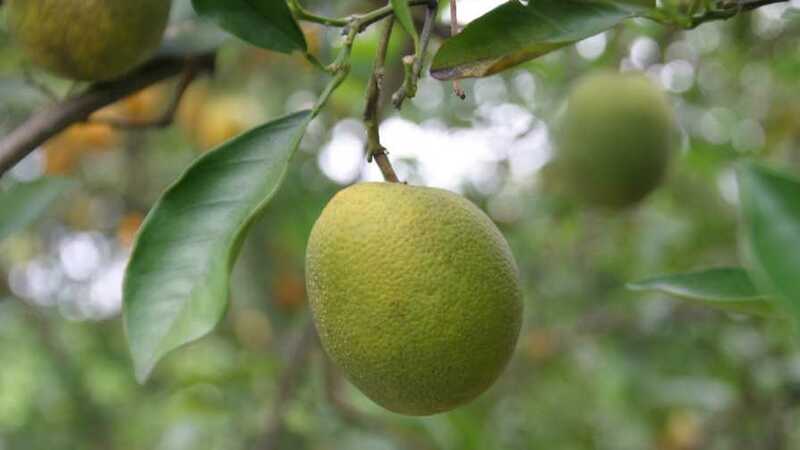 “In preliminary research, we have been able to see some positive effects of HBr on citrus tree health and fruit production,” stated Alferez, who’s based at the UF/IFAS Southwest Florida Research and Education Center (SWFREC) in Immokalee. So far, the hormone has not reduced the greening bacteria in the citrus trees, but Alferez and his fellow researchers have seen indicators of better tree health, such as more chlorophyll, suggesting the treatment might make citrus trees more tolerant to greening. Alferez and two other UF/IFAS colleagues (Tripti Vashisth and Christopher Vincent) received financial backing from the state legislature-funded Citrus Initiative to explore how well HBr would work on trees affected by citrus greening. Their research started this past growing season in experimental groves at the Citrus Research and Education Center in Lake Alfred and at the SWFREC. The team studied the same varieties, layout, and number of trees. If it can be determined how to correctly time the application of the compound, the findings also may help induce blooming at the desired time, Alferez said. Although HBr is commercially available and can be used for Florida citrus, UF/IFAS researchers are still researching its impact on citrus greening before making a final recommendation to growers. Paul Rusnak is the Senior Managing Online Editor of Florida Grower, American Vegetable Grower, American Fruit Grower, and Greenhouse Grower magazines, all Meister Media Worldwide brands. See all author stories here.